I have been doing a lot of client meetings recently and the key thing that comes up in virtually every meeting is the concept of tail risk, so I thought it was worth spending a little time here looking at why it is so sought after and how you may want to approach it. Intuitively tail-risk protection is highly desired as it allows you to have your cake and eat it too, i.e. 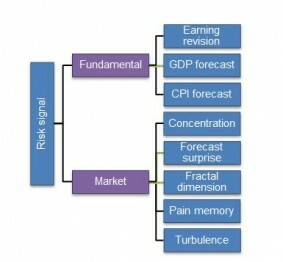 you can get the return of equities but without suffering from large market falls. This situation is arguably one that we have experienced for a large period since 2009 anyway as the Draghi and Bernanke Puts protected investors from the market downturns while forcing down volatility and driving risk-adjusted returns sharply higher. As we exit this period of US quantitative easing and artificially suppressed volatility, investors are getting more worried about the levels of risk assets and are looking to put programs in place to mitigate this risk. There are two ways to approach this, with the first generally only really open to institutional clients with significant budgets. They decide what kind of event they are trying to mitigate against, what level of coverage they need and how much they are willing to pay for it right now, as the costs will obviously vary with the level of implied volatility. They then engage the services of a specialist tail-risk manager. Obviously this solution is bespoke and should provide proper coverage when needed and is by far the optimal way forward. The second option, one available to most investors, is to invest in a pooled tail-risk offering or managed fund. The first issue with this pooled solution is that it is managed to one set of criteria and the event you are trying to cover could be completely different to other investors in the pool and indeed the pool itself, so the cover you would like may well not be available. The second key issue is that the cost of these strategies is usually large, both in general management costs (1-2% typically) and due to the bleed of constantly paying away option premia with limited sources of alpha (if any) to cover this cost. As these funds are generally measured against a cash (BBSW) benchmark they also necessitate a dedicated exposure which means you are dragging returns compared to other balanced/diversified portfolios. The cost structures of pooled vehicles are also dubious in that they often charge a performance fee. Tail-risk strategies are an insurance premium for bad situations – you really don’t want them to pay off – but if the bad scenario comes to pass is it really fair that the manager take 20% of your insurance payout? This performance fee also changes the incentive structure for the manager so the fund may not perform as you want it to at the critical times. The table below shows how expensive it is to achieve even basic portfolio protection using equity options. Here I have calculated the cost of covering an S&P equity index exposure with exchange-traded equity index options which kick in to protect a certain percentage of the portfolio at a certain loss level. 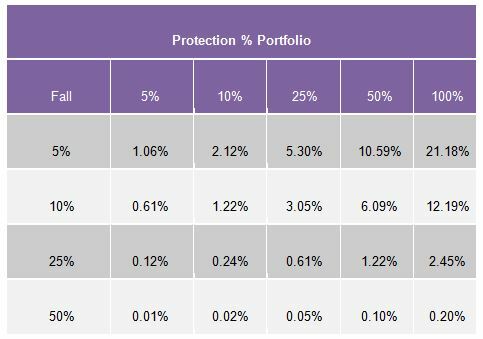 For example it currently costs 6.09% to protect 50% of your portfolio from a 10% fall – this is a massive number and far exceeds the current S&P dividend yield of 2.04%. 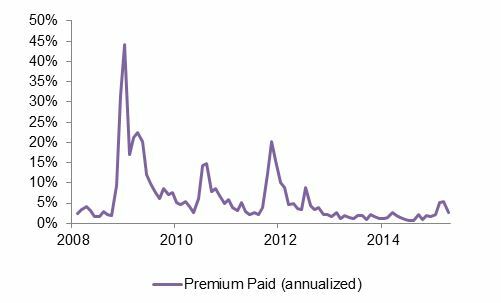 Table 1: Current Premium on SPX put options (as at 1/6/15) Chart 1: Premium to Protect 25% Fall Over 3 Months The table assumes a constant naive level of coverage but this leads us to the next problem with running tail strategies. If a tail event occurs volatility spikes as the market downturns intensify, but then volatility normalises reasonably quickly as the market stabilises at the new lower level; i.e. the protection looks to have worked initially but then bleeds its return. The key therefore is to run an actively managed strategy which looks to monetise the volatility spikes while still affording some coverage in case the underlying exposure were to fall further. So we can see by even a cursory glance that while covering portfolio exposure by utilising tail-risk strategies is a valid response to overextended markets, the mechanics of implementing a strategy can be difficult and the solution costly. There are other options though. By definition the best way to make sure you aren’t exposed to an equity market correction is to not own any equities (see what I did there? ); the second is to increase cash levels but this also lowers your prospective return. A lot of people view a cash allocation as a waste of time but I consider it as an option in that it gives you the opportunity/ option to invest at better levels were the market to fall. As such running high cash levels is a valid investment choice and one that is often overlooked. 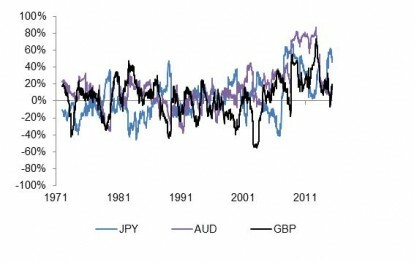 FX however is pretty much useless as a risk-off hedge as the drivers of FX change over differing periods. The short term is mainly technically driven with traders and hedge funds setting and defending levels, while the medium term is largely an interest rate differential game and the long-term picture is all about the politics (think Plaza Accord, Louvre Accord, Bretton Woods etc. etc.). 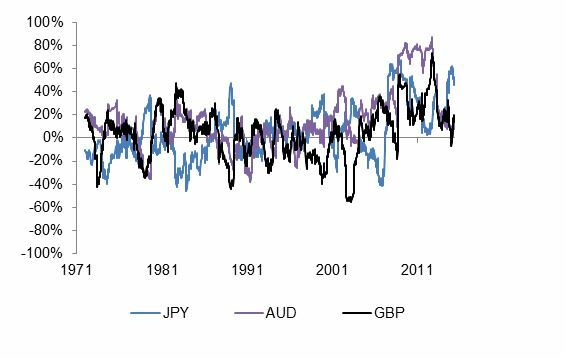 Because of this schizophrenic nature of FX, FX volatility is generally cheaper than other asset classes but generally affords you little protection as the drivers of the risk-off move are generally more important than the move itself. Chart 2: Correlation to equity market Source: Bloomberg So that leaves you with fixed income, or more specifically government bonds, as they are the only asset class that gives you a strong negative correlation to equities in times of equity market stress. Numerous ‘credit’ securities e.g. corporate bonds, emerging markets, high yield etc. have attractive characteristics but they also have positive correlations to equities in times of stress, with hybrids being the worst as they are negatively convex (look like bonds in the good times and equities in the bad times). The reason government bonds trade on such a low yield is because they are in high demand because of the security they offer. This is not to be overlooked. 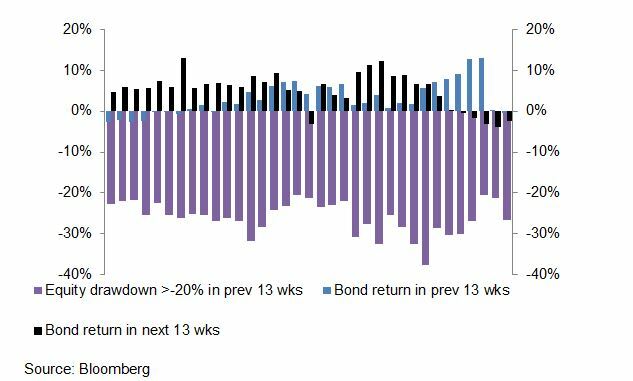 Chart 3: Bonds provides protection from equity drawdowns We (on the BTIM I&FI team) have run dedicated tail strategies in the past and are open to doing so again. Without explicitly stating it, however, tail-risk management is an integral part of the way we manage portfolios already. Our two main fixed income portfolios – the BT Wholesale Fixed Interest Fund and the BT Wholesale Pure Alpha Fixed Income Fund are both managed with a long volatility and long liquidity bias, which means they are managed to perform strongly when the markets are experiencing stress or dislocations. This is a deliberate stance and one that means the portfolios are ideally suited for the defensive allocation of broader balanced portfolios or ones where capital preservation is the key requirement. What you are getting is a defensive fixed income fund which looks to enhance its defensive nature when we think equities are likely to come under stress. So essentially what we are offering is tail-risk coverage but for significantly less cost (free in fact?) and for much less operational demand. The way we think about dealing with tails is to try to implement/ increase our positions before the equity market moves, rather than reacting to an equity down-move as volatility and equity moves are largely coincident. We achieve this by utilising our Risk Core-Scorecard models which acts as a traffic light for risk. As it switches from Green to Amber and finally Red it warns of an upcoming higher volatility period and allows us to start increasing the protection in the portfolio prior to this move. This is the kind of work that having a large team of Fixed Income Quants allows us to undertake and we find it adds significant value to our process. Diagram 1: Risk Core-Scorecard If you are a large scale institutional investor with a large fee budget you really should spend the appropriate time considering what risks you need covered and appoint a specialist tail risk manager to cover them for you on a bespoke basis. But the problem for most investors is that this is a complex solution generally open only to the largest of funds and the cost is often prohibitive. So I urge you to consider my fixed income funds to help protect you. Fixed income really is supposed to be the defensive asset class and only by managing it in this way can it play the role it is supposed to in portfolios.